How to: Perfect Red Lips – that last the day. A few weeks ago marked the day that I finally caved and bought Ruby Woo from MAC, possibly the most famous lipstick ever. Apparently, they sell 4 Ruby Woo’s to every other lipstick they have – if you ask me, that’s pretty popular. If you’re wondering how i’ve only just got my hands on it then I’ll tell you now. 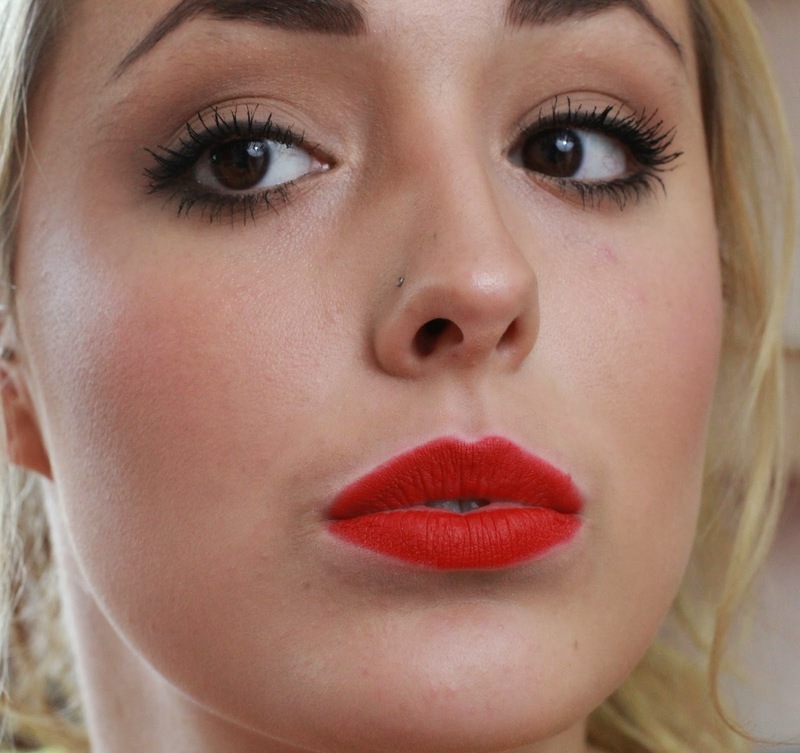 Basically, I’ve always loved a red lip but always been a bit scared of it. Not because it’s a bright colour and I’m too shy or anything like that but because I fear it needs too much upkeep. The dreaded patchy lipstick is never a good look and one that I would like to avoid. Another factor is the fact that red lipsticks need to be pretty long wearing, to avoid the previously mentioned patchiness and that comes with the risk of it being very drying. I decided to make this little pictorial for you all to show you how I make sure my lips stay red for as long as possible. Step 1: Start with nice and soft lips, try and use a lip balm before you start this process and then wipe off any excess with a tissue. Line your lips with a lip pencil that matches your chosen lip colour. Step 2: Use the same lip pencil to colour in all of your lips – this will act as a primer for your lipstick to ensure it stays on for longer. Step 4: Apply your lipstick, as normal. I can’t really offer any tips on this part. Step 5: Blot your lips with a piece of tissue until there is not much transfer. Step 6: Apply one more thin layer of lipstick. Step 7: Tidy up the edges using a concealer or a highlighter. I used the YSL touche éclat and it’s perfect. You can also separate a layer of toilet roll and place that over the lips and then apply a loose powder through the tissue. I don’t think that step is necessary with Ruby Woo but may be useful if you’re using another lipstick. Tip: Since red lips can make you look very put together and smart, try pairing it with messy hair and a casual clothes. Keep the rest of your makeup simple too, nudes are perfect. wow, you really have perfected the art of the red lip! This is stunning! I've always assumed that Ruby Woo wouldn't be THAT amazing (despite all of the hype), though, your pictures are convincing me otherwise! Great tips! I always have issues with the concealer around the lips part lol. I know it makes it look so much better, but I can't seem to get it down. Looks like I need to practice! Nice advice. I find it really hard to make my lipstick last more than an hour. ← FOTD & First Impressions.